Unless you've had your head somewhere unmentionable, you probably know we had a significant earthquake in Napa Valley last weekend. At 3:20 a.m. on August 24, a strong 6.0 quake rolled through, the California equivalent of hazing for new residents. Welcome to our state, where living on land sometimes simulates living on a boat. 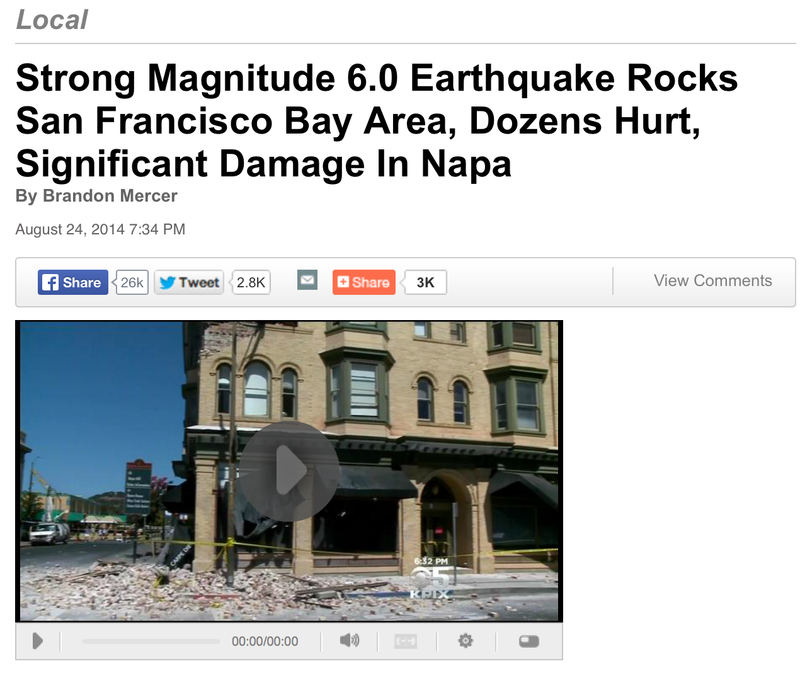 We were fine here in St. Helena, just over 20 miles from the epicenter, but it was a BIG one. Our little cottage was creaking and the (four) dishes in the cabinets were rattling. We had no doubt about what was happening. Napa, the town, only a few miles from the epicenter in American Canyon, took the worst hit, but perhaps the greatest casualty was truth in the media. As they tried to make sense (and the most) out of the shakeup, there were some ugly missteps. ... et tu, Washington Post? An early article from WashingtonPost.com claimed the quake, "couldn't have come at a worse time," which was their attempt tie the quake to California's drought. However, had they asked, they would have learned that the quake hit at the best possible time (if there is one? ): Most fermenting tanks were empty and waiting for imminent harvest. And most significantly, the timing at 3:20 a.m. meant that wineries were empty. Had the quake occurred during the day or even a few days later during harvest, the story would have been quite different. I added the NOT TRUE, lest I perpetuate a falsehood. "With Napa out of commission"?!?!? It's been a week with ample opportunity to vet the impact of the earthquake on the Napa wine industry. 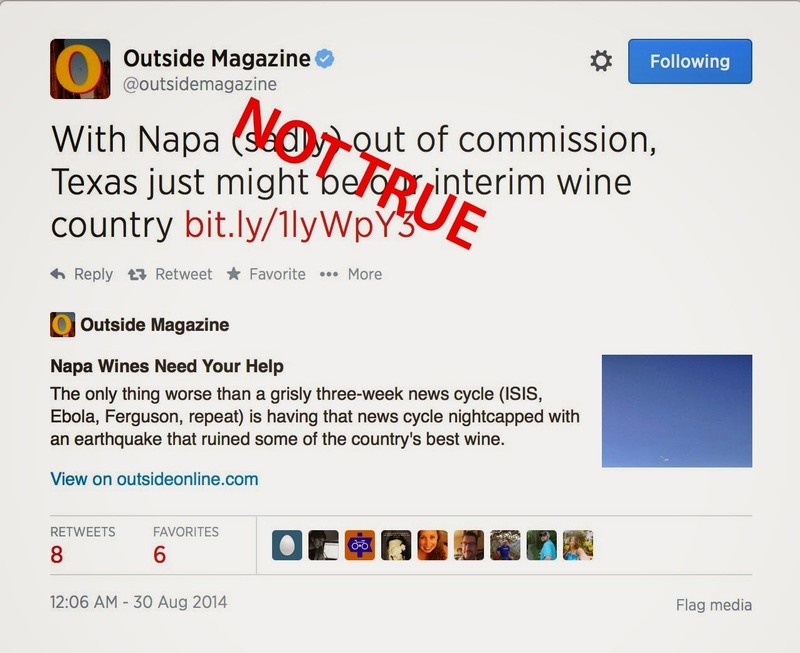 This was Outside's second volley on Twitter promoting this lame article, an incredibly lazy interview of the Whole Foods global wine buyer, the sole source, who, contrary to the inflammatory Tweets and headline, says the earthquake will have no effect on supply. On the first Twitter post, I was the only one who took Outside to task, but fortunately on the one above, others started chiming in. Disappointing, lax "reporting" from Outside, a magazine that I've previously respected. Of course, there was some non-shaky reporting going on, among the best was AFPs Glenn Chapman, who grasped the nuances of how things shook out, so to speak, even in a breaking story. Ironically, he also quoted Chip, my Chip, who works at Silver Oak: "I think our wine tastes better after being shaken, not stirred." Chip always knows the right thing to say. Here's a roundup of local paper front pages from wash post, a visual that underscores the significance of this story in the local market. *As a bizarre footnote to this earthquake incident, we were in one other earthquake, three years ago by one day. That whole incident was much more alarming and has a much stranger (and longer) story. 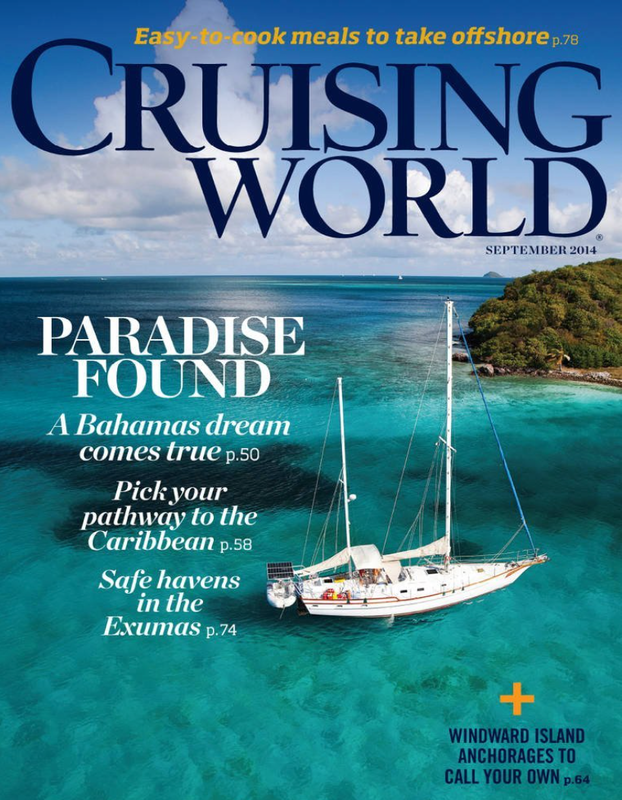 We're back on land, but you wouldn't know by looking at Cruising World. 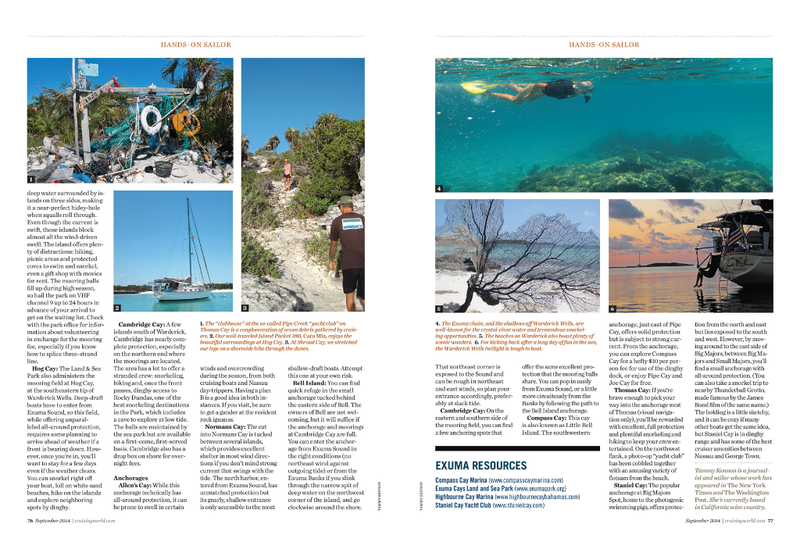 My article about Safe Havens in the Exumas came out in the September issue! 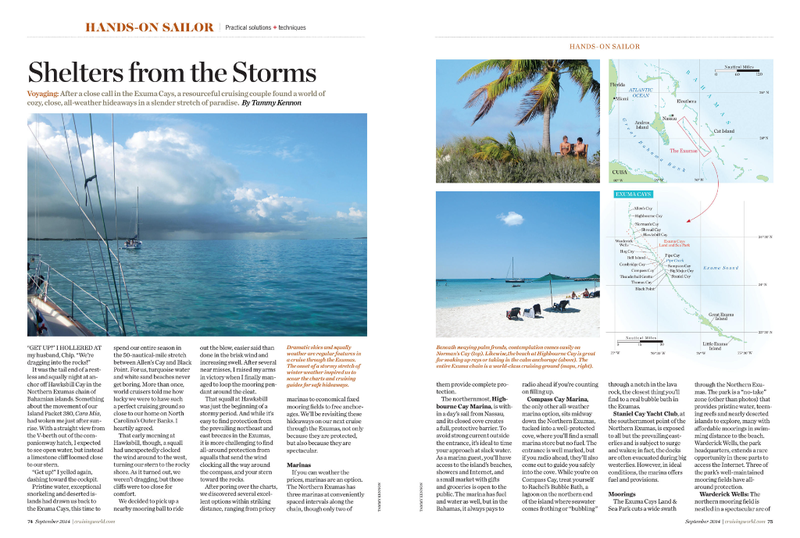 It's my first national magazine spread and with my own photos to boot. Unfortunately, it isn't available online, but I captured it here. BONUS: That's our daughter Casey and her boyfriend Rémi on the upper right. For the record, those two photos of me, snorkeling and sitting in the hanging chair, were taken by Chip Sellarole. As the sun dropped behind the Mayacamas Mountains, I headed southeast from my house, walking along the railroad tracks. In the late August dusk, the grapes hang heavy on the vines, the deep purple of the world's worst bruise. I take a sample, plump and dark, the grape threatening to burst under its own goodness. It erupts in my mouth, ripe juice, sweet and soft, a stark contrast to the bite of the skin, the crunch of the seeds. Rounding the third vineyard, I reach our little local library and drop off my Fodor's guide to Northern California. As I turn back to the north, the glory of Mount St. Helena looms in the distance, backlit by the invisible sun. I saw a report today that claimed my money buys a lot less in California than it does in other parts of the country, but I think they forgot to figure in the things money can't buy, the sweeping valley all green and gold and purple, the crisp cool air that settles in after the bright heat of the day, the thrum of promise and excitement as harvest time approaches. The low moan of the wine train comes from the south, and I can hear the train slowly lumbering up, chugging, chugging, until it's right beside me. The conductor leans his head out the window. "Hello," I say as he passes. "You have a great evening!" he calls. And looking out across our beautiful valley, I think, how could we not have a great evening. 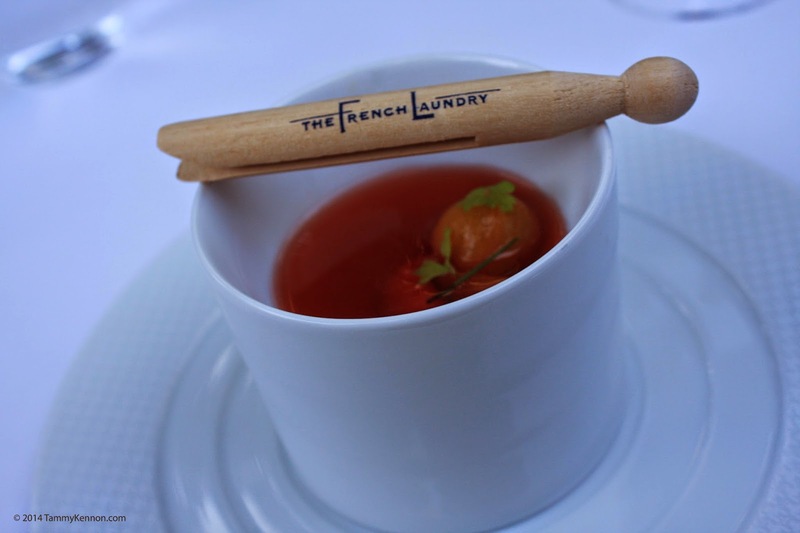 Every special occasion begins with a glass of bubbly, but not every special occasion includes a 17-course meal at The French Laundry. 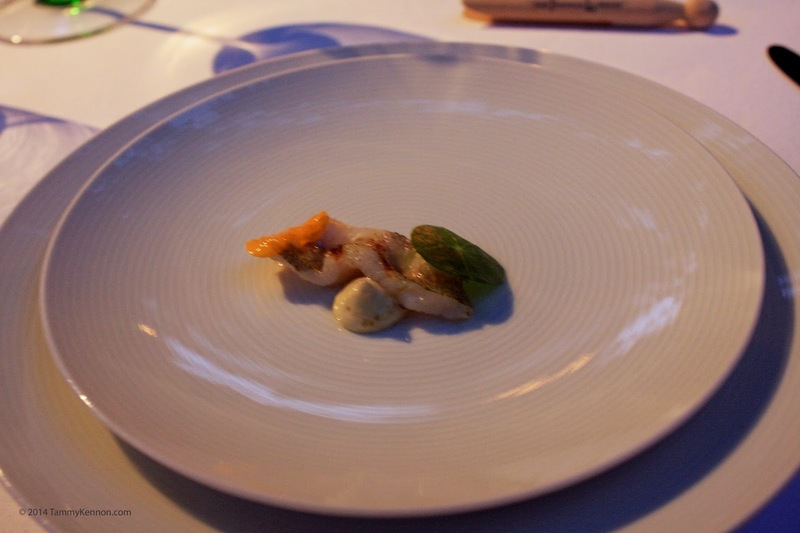 There was just this one, teetering at the pinnacle of eating. 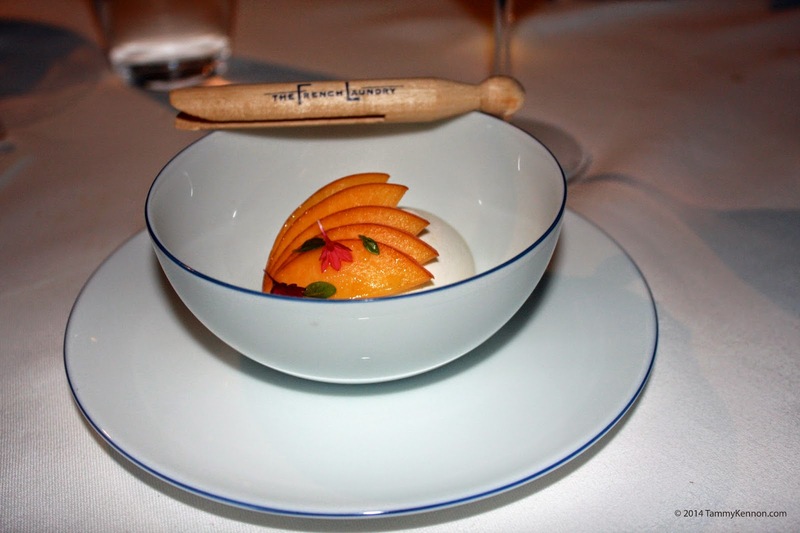 Chef Thomas Keller's welcoming tidbit for every visitor to The French Laundry or Per Se (his New York restaurant) is a tiny ice cream cone. At least it looks like one, but it's really a savory salmon and creme fraîche morsel, intended to make even the most terrified diner smile. 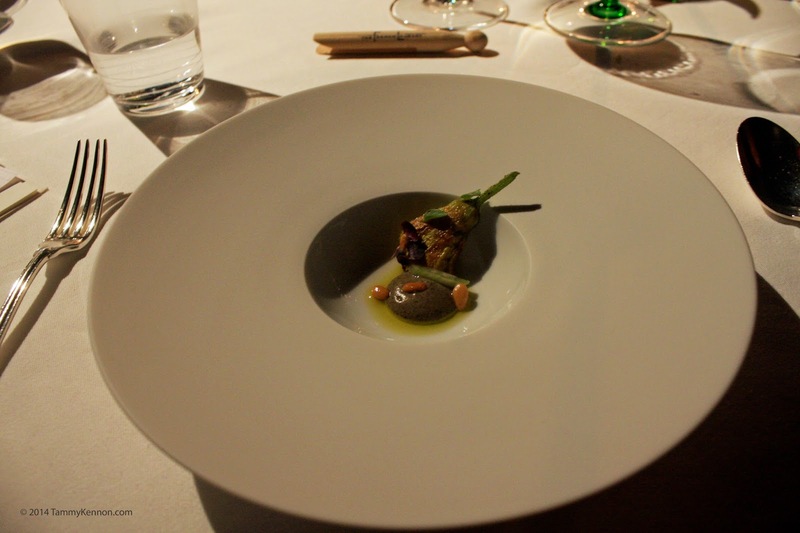 For me, it was the first hint that Chef was going to change my whole experience of eating. 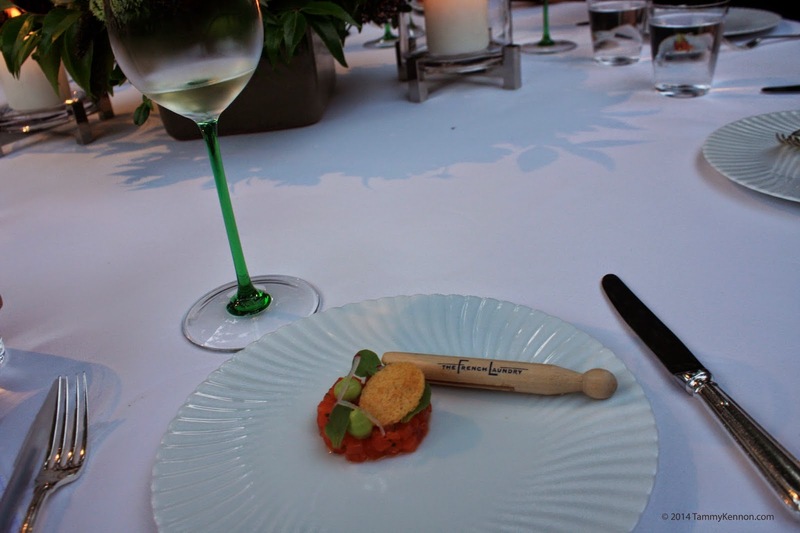 I anticipated the explosive flavors, the satisfying color combinations and perfectly tweezed presentations, but it was his artistry with texture that caught me completely unawares. 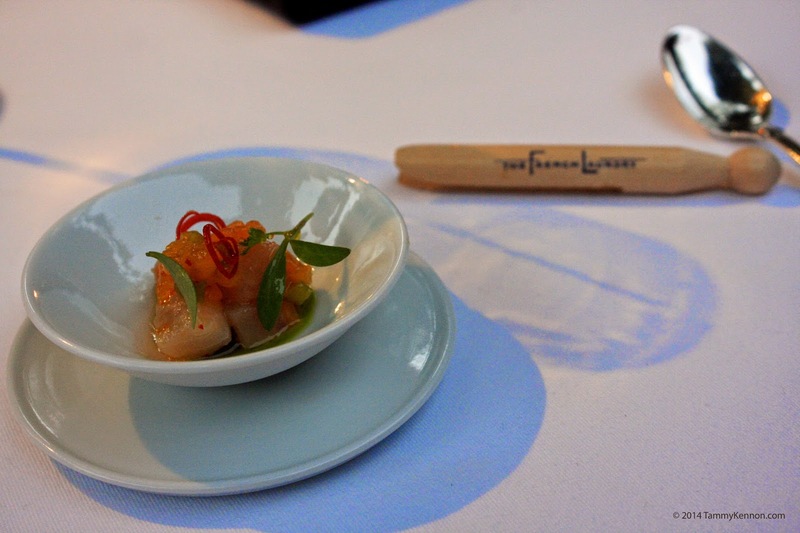 This wee cone, and every dish that followed it, combined creaminess, crunch and crisp crackle in a way that made me stare off into the distance contemplating what was happening in my mouth -- the biggest food surprise since Pop Rocks. Every dish, 17 times, a perfect marriage of sensation. Our ice cream cones arrived at two minutes before 7:00, and the surprises kept coming, one after the other, for five hours. Could he outdo himself 17 times? Why, yes, yes, he could. *One note about photos: We were dining happily al fresco, so the lighting morphed over the evening. My apologies for this variation. Summer Squash Confit, Garden Tomatoes and "Fines Herbes"
That's only four courses. How ya holding up? 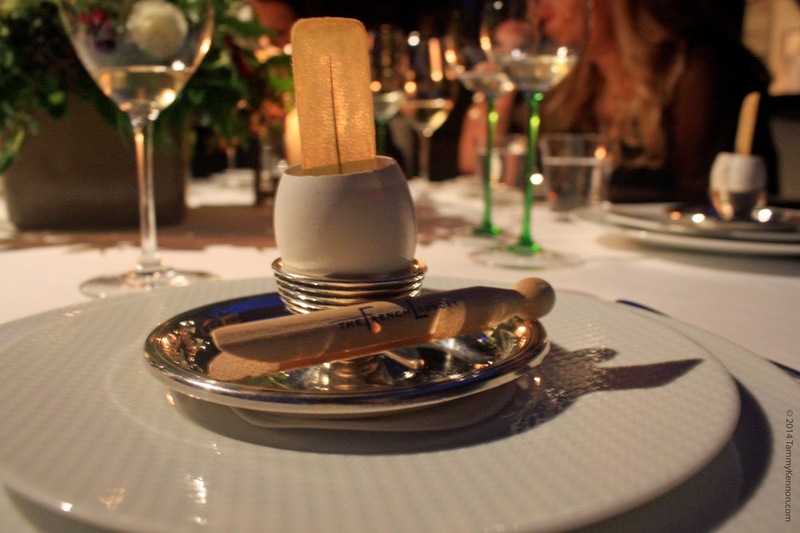 Yes, that's a real eggshell. One guy's job is prepping these shells, smoothing the lip and cleaning them. "Custard" does nothing to describe the exquisite creamy interior covered with a swoon-worthy broth. That is a potato chip, elevated to the heady level of high cuisine, paper thin, the perfect crisp foil to the super smooth custard. I'm still wondering how they got that chive embedded inside. We're just over halfway through. 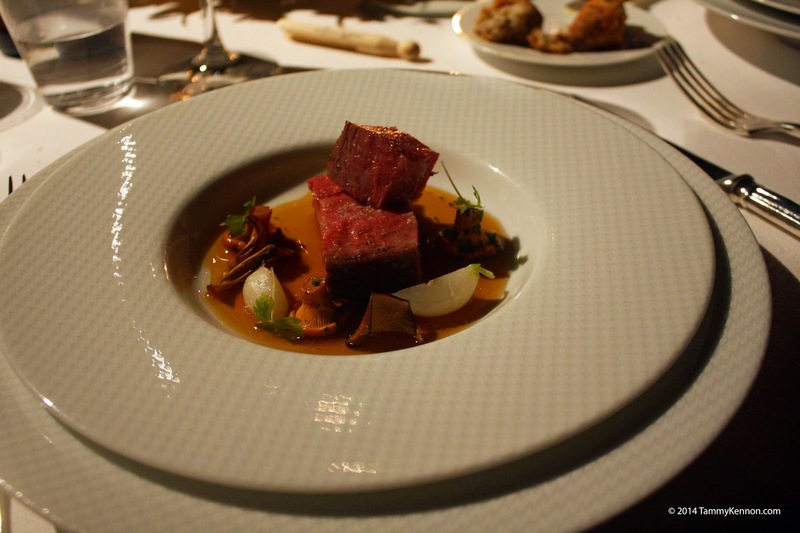 Last month, Chef Keller was on NPR's Wait, Wait, Don't Tell Me. 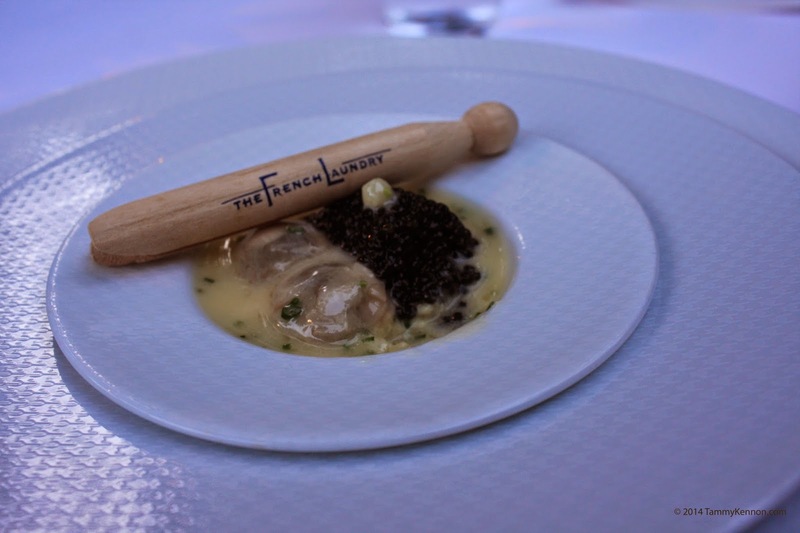 He explained his theory that revolutionized the American restaurant scene when he opened The French Laundry 20 years ago. "The more you have of something, the less you like it. So we want to give you just enough that when you've had that last bite, you go, god, I wish I had a little more. And then you say no, you can't." It works. As an attractive waitperson took away each dish, I watched after the empty vessel longingly until they had whisked it through the door and out of sight. Noooo!!!! 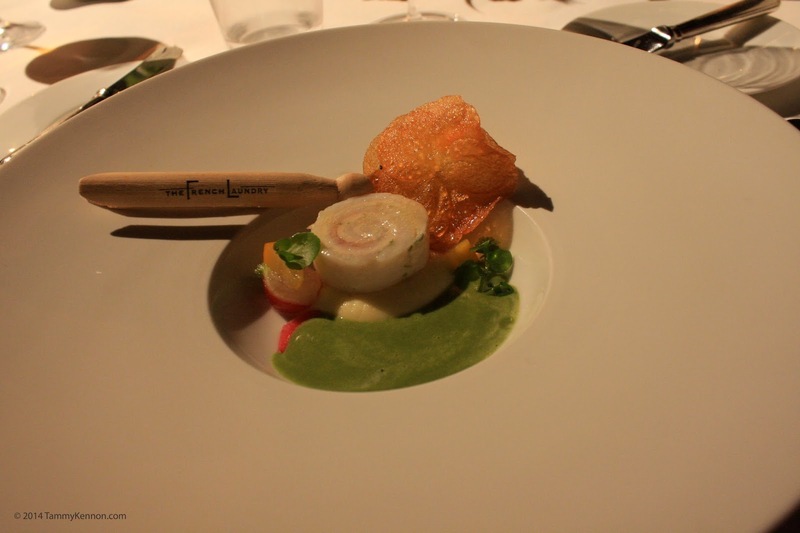 La Ratte Potato Purée, Garden Radishes, Meyer Lemon Confit and "Pommes Maxim's"
I had this, while those who foolishly failed to declare shellfish allergy had lowly Sweet Butter Poached Maine Lobster. Now, we moved on to course eleven, and things just kept escalating. Oh, yum. BUT WAIT! There's another ingredient to add. That's a wafting Australian Black Winter Truffle, mid-shave. 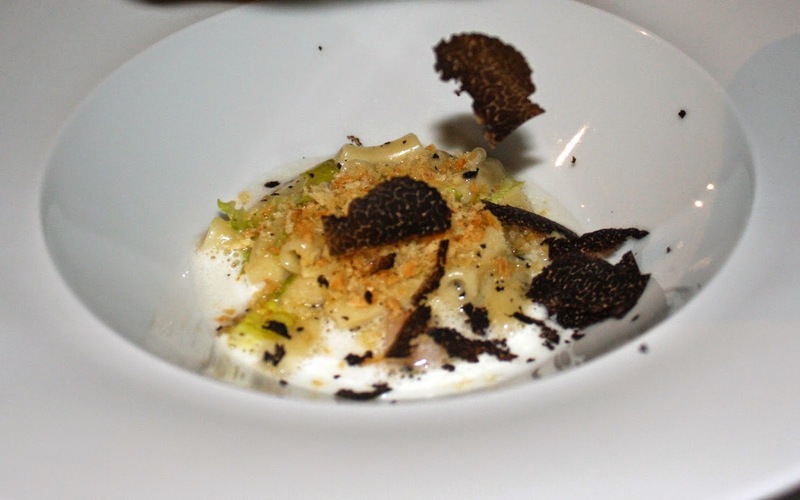 Chef does not scrimp on truffles. The toasted quinoa added the most enchanting bursting crunch, like those little red roe eggs that hide in my mouth after I eat sushi, filling me with utter joy when I discover one long after the last bite. 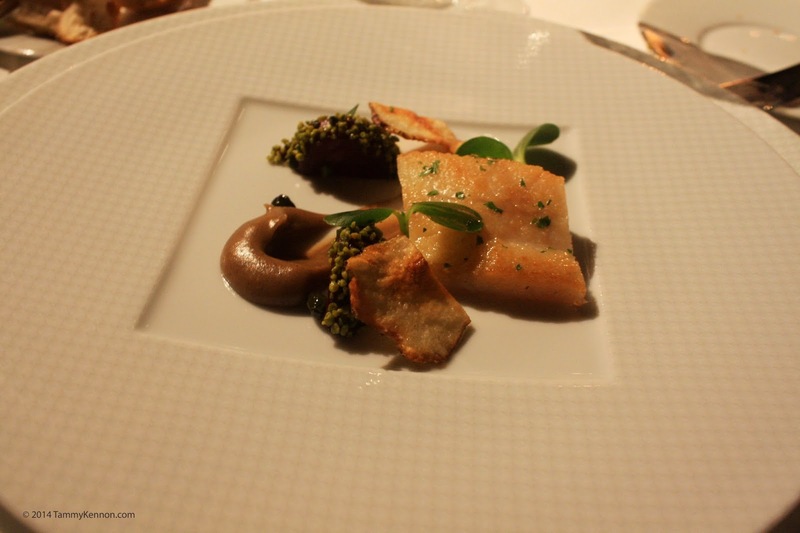 "Champignons a la Grecque," Celery Root Confit, Garden Turnips and Manzinilla Sherry "Bouillon"
This is when Chef graced us with a visit to say hello to our hosts, John and Lindsey. 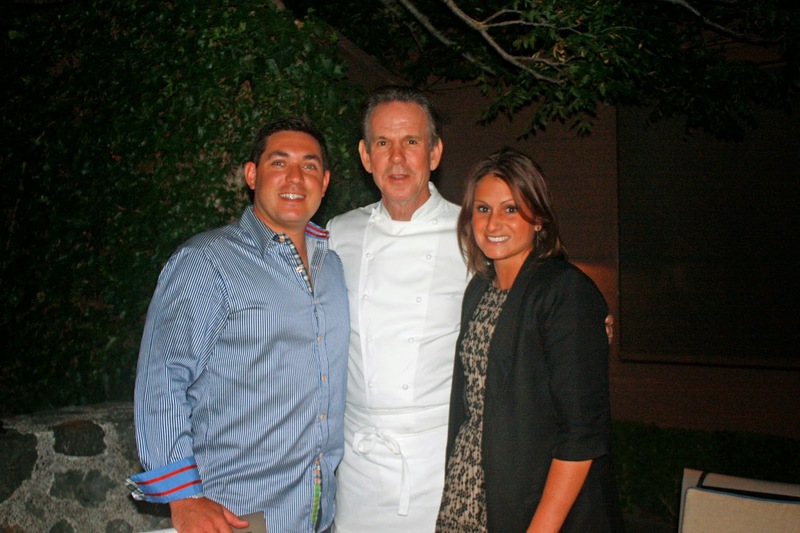 The gracious kitchen wizard himself, Chef Thomas Keller, with John and Lindsey. As promised, our extravaganza ended with "a series of desserts." Other sweeties, Délice de Bourgogne, which is the most shockingly wonderful thing ever made with figs, Toast-flavor ice cream (not kidding) and Rocky Road, a flourless chocolate cake, which needs a name more descriptive, like "your-life-is-now-complete cake" or "the-cake-that-ruins-you-for-all-other-cakes cake." There was something mysterious and non-liquid served in an espresso cup, intended (apparently) to make me look foolish for trying to sip it. 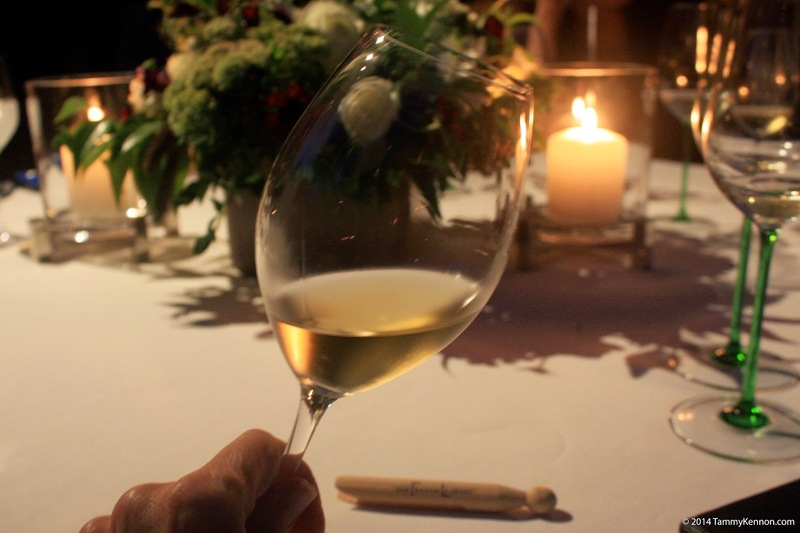 There were macarons, gelées, and so many more things than I could get around to tasting, because the 17-year-old Sauturnes was too incredible, dessert in a wine glass. And, though certainly not an afterthought, I will share the wine pairing list here for the oenophiles in my audience. And then they gave us each a tin of cookies to tide us over until we got home. 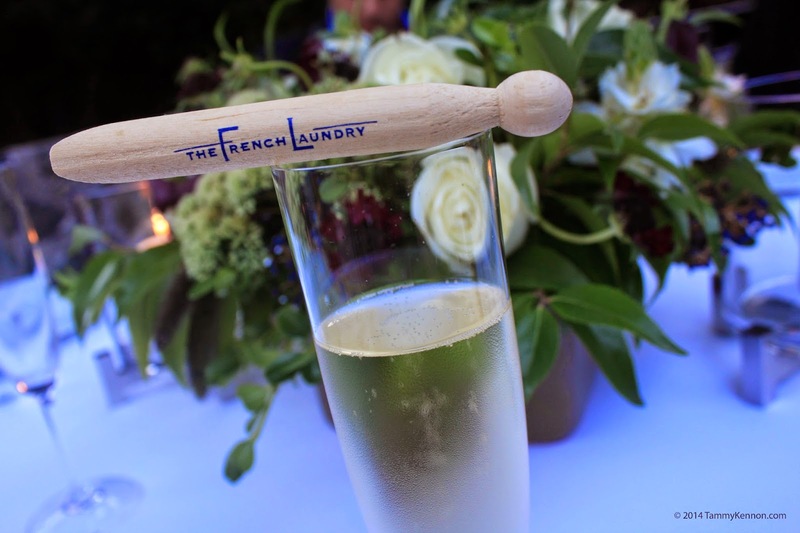 Finally, I mention that I have faithfully transposed all of the restaurant's own "quotation marks" for which I have no defense other than that, despite all my editorial training, I trust The French Laundry completely.